LIMITED LIFETIME WARRANTY The product has been manufactured by WoodCrafters Home Products, LLC and is warranted under normal use and service, to be free from defects in material and workmanship for the life of the product from the date purchased. For more information, please review the full warranty information found in the installation guide of your product. With a modern look and strong design, this vanity will help any bathroom look nicer. Its comes with a nice green acrylic counter and brown solid wood base for strength and style. Bring a classic look and feel to your bathroom with this beautiful set from Art Bathe. Enjoy the popular modern look in your bathroom with this beautiful vanity. Made with a special brown solid wood base and a brown quartz counter, this piece will make your bathroom look even nicer. Made with a roomy single-door cabinet and drawers, this vanity has lots of room to keep items like toothpaste, towels, and hair brushes. This classic set from Art Bathe will make your bathroom look brand new. Designed with a modern style and strong build, this vanity is a perfect choice for any bathroom. Its white ceramic counter and brown plywood base are very easy on the eyes. Keep many bathroom items in its roomy drawer and double-door cabinet. Add a classic feel to your bathroom with this simple vanity set from Fresca. Enjoy the popular modern look in your bathroom with this beautiful vanity. Its white ceramic counter and brown plywood base are very easy on the eyes. Made with a roomy double-door cabinet and drawers, this vanity has lots of room to keep items like toothpaste, towels, and hair brushes. Bring a classic look and feel to your bathroom with this beautiful set from Fresca. Ashland II 36-inch 3-Drawer Vanity with Top in Chocolate Brown This vanity has both an all-around look and a modern style. The white ceramic counter and brown particle board base make this piece great for any bathroom. This simple vanity set from GLACIER BAY will fit right into any bathroom decor. 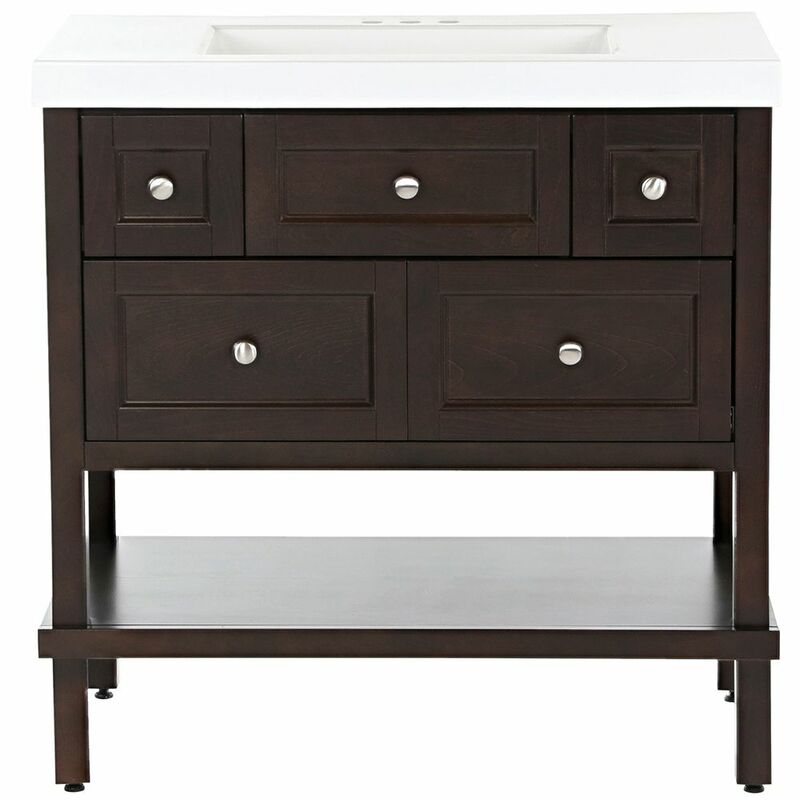 Ashland II 36-inch 3-Drawer Vanity with Top in Chocolate Brown is rated 3.4 out of 5 by 222. Rated 4 out of 5 by HomeDepotCustomer from It looks great... the height is counter height which I... It looks great... the height is counter height which I really like.The sink top just sits on top or the base and has to be glued on with silicone or something.... I would prefer that it fit over the bale frame. Rated 5 out of 5 by Skyeasy3 from Very nicely constructed and has lots of storage. Very nicely constructed and has lots of storage. Rated 4 out of 5 by John from The Vanity is cute and nicely designed. I am... The Vanity is cute and nicely designed. I am well pleased with the purchase. Rated 1 out of 5 by DissapointedInMN from First product I've ever fully installed and then removed and will return (bought & installed/unin... First product I've ever fully installed and then removed and will return (bought & installed/uninstalled today, going back tomorrow). Like others I found the top absolutely does not fit the base. The top doesn't use hardware and should settle onto the frame. Instead the cutout is too small for the base so you are forced to rest it on a very narrow portion of the lip instead (hard to explain). The only contact between the base and top are four corners (no contact along the front or the back support). Went back to the store to get tips/tricks to fit it to the base-nothing can be done, it's simply too small. I also had the issue with ill fitting drawers, even after adjusting the face plates for "shipping settling" as the manufacturer suggested. Didn't work (seems to be an issue with the rails bowing with the weight of the top resting on just the four corners). Final straw for me was the fact that the wrong screws were packed for the hardware. There are two types; the smallest was approximately 1/2" longer than the length of the drawer panel and knob combined (ie, the smallest screw was far longer than the width of the drawer face and hardware combined, so you "bottom out" in the hardware with a lot of screw still left). After searching the house high and low and finding I only have wood screws, I gave up. Usually have great quality at Home Depot-this was the worst I've actually ever bought anywhere. Don't buy this product. what is the spread on this for the faucet? From the left side of the left hole to the right side of the right hole is 5&quot;.